Opis: Who Was Jack Wilson, the Singer of Shakespeare's Stage? An Attempt to Prove the Identity of This Person With John Wilson, Doctor of Musick, in the University of Oxford, 1644 (Classic Reprint) - Rimbault Edward F.
Szczegóły: Who Was Jack Wilson, the Singer of Shakespeare's Stage? An Attempt to Prove the Identity of This Person With John Wilson, Doctor of Musick, in the University of Oxford, 1644 (Classic Reprint) - Rimbault Edward F.
Recenzje: Who Was Jack Wilson, the Singer of Shakespeare's Stage? 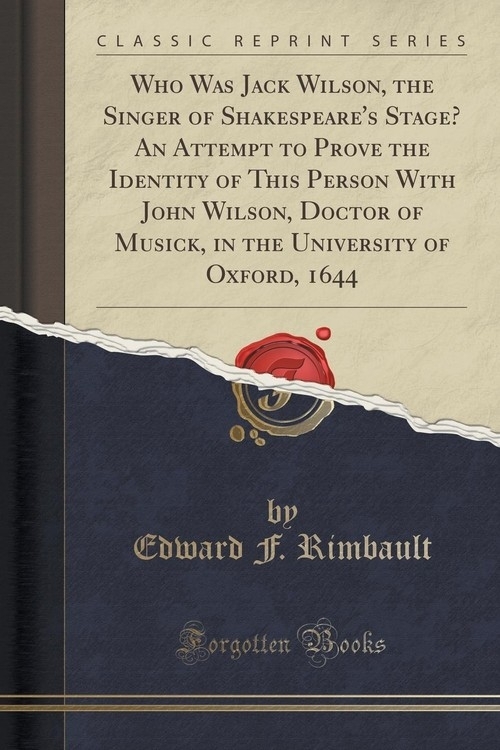 An Attempt to Prove the Identity of This Person With John Wilson, Doctor of Musick, in the University of Oxford, 1644 (Classic Reprint) - Rimbault Edward F.